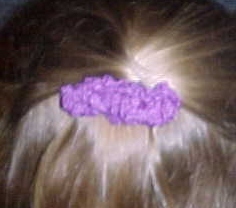 Attach yarn in the hole at one end of the barrette. Working around the top part of the barrette so you don't interfere with the way it snaps closed, sc around the barrette until it is full. Sl st in the hole at the opposite end of the barrette. Ch 3, turn. Working in the fl only of each sc, (2dc, ch 2, 2dc) in each st. Once you get to the other end of the barrette... begin working in the rem lp of each st placing (2dc, ch 2, 2 dc) in each rem lp. Join with sl st in top of 1st dc made.